Whether it is a couple of inches or a couple of feet, for some kids just having snow on the ground is thrilling enough. However, snow angels and snowmen sometimes don’t cut it for the more adventurous snow lovers. They want a thrill, a way to show their artistic abilities, or a way to start a neighborhood battle. Whatever kids, or adults, like to do in the snow, these are just 10 of the coolest snow toys they can use. Snow sleds come in a variety of shapes, colors, sizes, and ability levels. Some are more traditional, and some are more unconventional for a wilder ride down the hills. Read on to find out more about 2 of the popular sleds for this winter season. The Zipfy Luge Snow Sled is a compact, light-weight sled designed for fast rides down hills and slopes. It is constructed of a high-density polyethylene plastic for durability. The Zipfy features a seat area and a vertical handle on top, with a rail system on the bottom for maneuverability. One of the safest and easiest ways to sled it provides a quick ride down the hill and is light weight for carrying back up the hill. Riders simply sit, put their legs straight out, and hold on to the handle. The bottom rails provide the ability to carve through the snow and make sharp turns. This versatile snow sled is designed for people of all ages, 6-106. It will hold a weight of up to 250 pounds. The Zipfy has been known to provide a safe and comfortable ride to those with back problems who aren’t able to ride traditional flat sleds. The Zipfy weighs in at an extremely low 3 ½ pounds. It is 21 inches long, 13 inches wide, and 16 inches tall. This is one of the only sleds you can find that can be used easily by the whole family. It doesn’t matter if it’s your first time sledding at the age of 5 or if you’ve sledded for years. The Zipfy is easy to control and simple to stop by putting your feet down in front of it. It comes in 7 vibrant colors so there is sure to be one for everyone. The Zipfy Freestyle Luge Snow Sled is available at many well-known retailers including Wal-Mart and Target. It can also be found at some local hardware stores and many online specialty retailers. The Lucky Bums Racer Sled is the perfect sled for younger kids who are a little more daring and like to go fast down the hills. It is constructed of durable plastic and features a wide center track that can be steered to control direction and maneuverability. This cool sled is equipped with a sure-grip steering wheel perfect for little hands as well as two handbrakes to control speed as they race down the hill and make sharp turns. This racer also includes a pull rope for adults to assist riders back up the hill or to simply pull smaller riders along a path. Manufacturers recommend this sled for children ages 4-6, but it can be used by children up to 8-12 years old who are smaller in stature. It is designed for only 1 rider with a maximum capacity of 100 pounds. The Lucky Bums Racer is 40 inches long, 20 inches wide, and 10 inches tall. It is a lightweight plastic with a total weight of approximately 5 pounds. This snow sled is guaranteed to provide hours of entertainment on the snowy slopes. It is lightweight and simple to maneuver. It is durable and constructed of smooth plastic that won’t scrape or poke little hands and feet. It comes in three bright color combinations including pink/black, blue/yellow, and red/yellow. One of the safest racer sleds you’ll find it has a wide base and molded foot holds for stability. And what kids wouldn’t want a sled that they can steer and slice through curves at their own speed? The racer sled can be found at several retailers and online stores including Walmart, Kmart, and Sears. It is also available from several sellers on eBay and Amazon. It doesn’t matter how old you are, a snow ball fight is a definite must when it comes to playing in freshly fallen snow. While making the perfect snow ball does take some experience, everyone will be able to make them perfectly with this cool snowball making kit. The Snowball Maker Tools are a cool kit that includes 11 different pieces for digging, playing, and forming snowballs in the snow. It has 4 different molds with handles for scooping up snow and forming it into perfectly rounded snow balls, a soccer ball, or even a snowman shape. The shovel and bucket are perfect for digging and hauling snow, while 2 smoothing tools can be used for perfecting the walls of a snow fort. This handy kit allows kids (and adults) of all ages to enjoy hours of snowball fun without getting their gloves wet and cold. This kit is for anyone of any age, young or old, who enjoys playing in the snow or partaking in an epic snowball fight. The entire kit is made of light-weight plastic and weighs about 3 pounds all together. Each of the pieces in the kit varies in size. The snowball makers with handles are approximately 14 ½ inches long. You need it because it’s cool! And the best way to keep hands dry while making snowballs and digging in the snow. Pieces are constructed with comfortable, easy-grip handles. This kit is made of durable, BPA-free plastic so it will last through many winters and allows kids to get creative while playing outdoors in the winter. 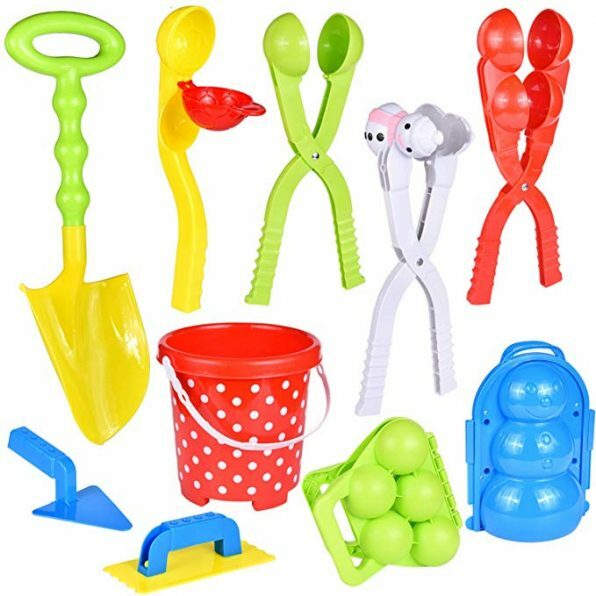 This 11 piece Snowball Maker Tools which includes a mesh bag for holding and storing everything can be purchased at Amazon. 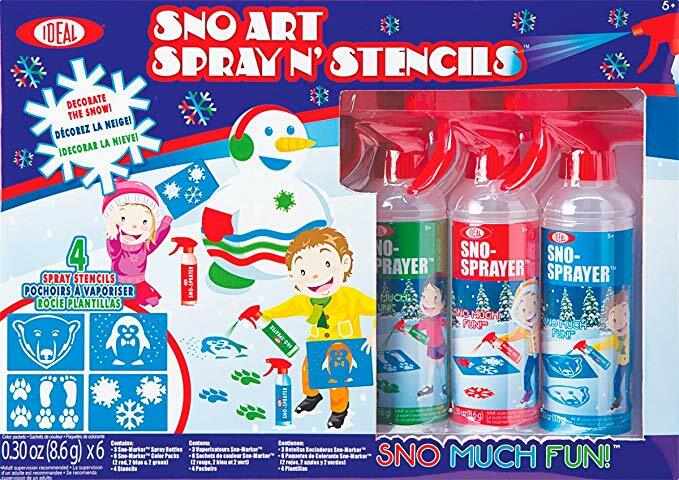 The Sno Art Spray N’ Stencil is an art kit for the wintery outdoors. If you have kids who want to get creative outside then this is the snow toy for them. This art kit includes 3 Sno-Sprayers that will hold one of three colors- red, blue, or green. Before heading outside simply fill the sprayer with warm water, add a color packet, and shake. Kids can use one of the 4 snow stencils to create images that include a penguin, snowflake, footprints or a polar bear. Or they can free hand a picture of their choice by simply spraying the snow with any design. The bright colors are non-toxic and can be used in the lawn, on the sidewalk or even on the trees. This snow art kit is recommended for children ages 5 and above. The stencils in this kit are 8 inches by 11 ½ inches. The entire kit weighs less than a pound. If you love doing sidewalk chalk in the summer, this kit is a way to use your creativity in the winter months too. It is safe and simple to use and will provide hours of entertainment, especially to the kid in your family who is less adventurous and doesn’t prefer to sled or throw snowballs. The Ideal Sno Art Spray N’ Stencil is available at many stores and online including Kmart, Target, Farm and Fleet, and Kohls. It can also be purchased on Amazon. This Snowman Kit is the perfect accessory for snow day creativity. Gone are the days of using carrots, raisins, or rocks to give your snowman a face. Now you can give them the exact expression you want with one of the 40 pieces included in this Snowman Decorating Kit. Choose from red or black ovals for a mouth or a giant, toothed grin. Eyes can be made from simple colored circles or can include a pair of glasses. Your snowman will truly be able to express himself with one of the bright colorful hats that are included. Pieces are made of wood and attached to wooden dowels that make it easy to insert them into the snow. They can be used over and over again to change your snowman’s appearance or create an entire family of snow people. The Snowman Decorating Kit is perfect for the entire family. Manufacturers recommend it for children ages 5 and up. There are 40 pieces included in this snowman kit. They range in size from 1” high to 12” high. When stored in their convenient bag all the pieces together weigh approximately 3 ½ pounds. This is one of the few Snowman Decorating Kits that allows you to change the expression of your snowman. It has several mouth, eye, nose and ear designs to choose from. It even includes a variety of head pieces and buttons too. The components are sturdy, come in bright colors and are easy to use. They can be stored in the handy included cloth bag. The 40 piece snowman decorating kit can be purchased on Amazon. It’s not a skateboard or a scooter or a snowboard, it’s the GeoSpace Ski Skooter. The perfect snow toy for anyone who may enjoy snowboarding or skateboarding, the Ski Scooter allows riders to glide along smooth, flat surfaces including snow, grass, or even sand dunes. Simply place one foot on the non-skid foot tread and use the other to push yourself along. It is made of super-light, super-strong polyurethane, making it lightweight and easy to maneuver. The collapsible handle allows riders to steer and provides balance. It can also be folded down for ease of transportation. 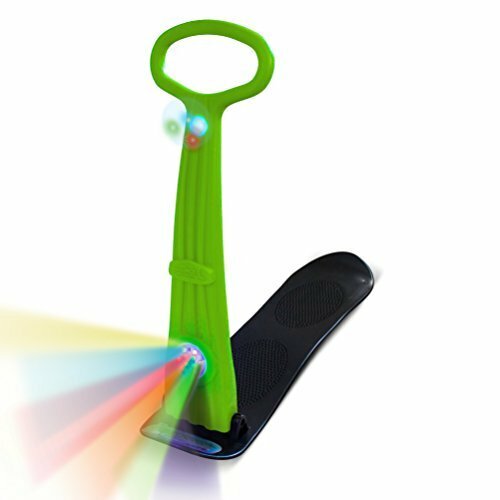 The GeoSpace Illuminator Ski Skooter is for children of all ages over the age of 4. It can also be used by adults under 220 pounds. This scooter can be used in any season as long as there is a smooth, flat surface for riders to utilize. Weighing in at only 3 pounds the Ski Scooter is super lightweight. It is 9.75 inches wide and 36 inches long. When the handle is extended the scooter is 30 inches tall. 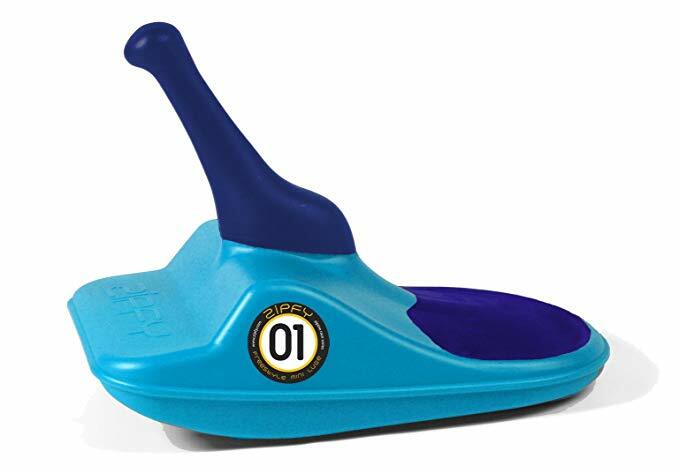 Even though it is called a Ski Skooter, this toy is versatile enough to be used in any season on grass, sand or even indoors on the carpet. It is simple to maneuver and strong enough to hold up to 220 pounds. It comes in three bright colors including red, green, or blue and has 2 multifunction LED lights on the handle. One of the lights has 20 different functions and can be controlled with a wireless remote. If you enjoy skateboarding in the summer or snowboarding in the summer this Scooter gives you one more option for gliding along the ground. Several online retailers carry their own version of this scooter. This specific model can be purchased at Target or Amazon. This is the must-have Wham-O SnowBall Blaster. Take your snowball fight to the next level with this blaster that will not only form the perfect, throwable snowball but it will also launch them for you. The snowball press on top will mold 3 snow balls and is removable for ease of use. The blaster is perfect for long-distance battles as it will launch a ball up to 80 feet. A comfortable, ergonomic handle is designed to support and stabilize the wrist during use. The Wham-O SnowBall Blaster is a great toy for those adventurous kids who love to engage in a wild snow ball fight. It is recommended to be used by children ages 8 and older. The blaster is 16.7” x 11.7” x 5.5” and weighs approximately 1.5 pounds. If you love a good snowball fight then this Blaster is a must-have. It allows the user to launch perfectly rounded snowballs up to 80 feet and includes a mold that forms 3 compressed snowballs in a matter of seconds. It also includes a scored game. The Pipeline Sno Igloo Snow Slide is just one more unique way to have fun in the snow. Not enough snow to build a natural snow slide? 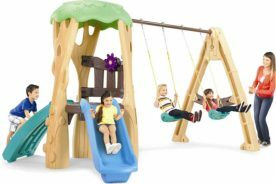 Your yard isn’t big enough for a swing set with a slide? Then this is the perfect snow toy for your little ones. Made of the same material as a snow tube, this inflatable slide is durable and lightweight so you can use it anywhere in your yard and move it around easily. 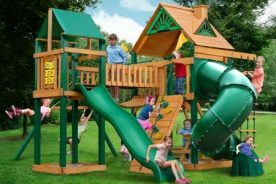 After the snow falls simply blow it up and watch as your kids have a ball climbing the steps on the back and sliding down. They can even hide or sneak through the tunnel below. Manufacturers recommend this Snow Slide for kids ages 3-6 years. 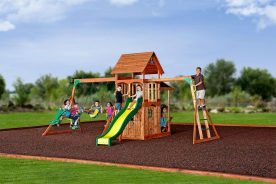 However, many previous users say its size is much more suited for younger children around pre-school age. This particular snow slide 16 x 10 x 6.8 inches before inflation. After inflation it is 70 inches long, 30 inches wide, and 36 inches high. Constructed of heavy-duty PVC, this inflatable snow slide is perfect for providing hours of fun for the little ones in your family. They will love climbing the stairs which are equipped with 2 handles for added safety. This slide is easy to inflate and deflate for storage while not in use. 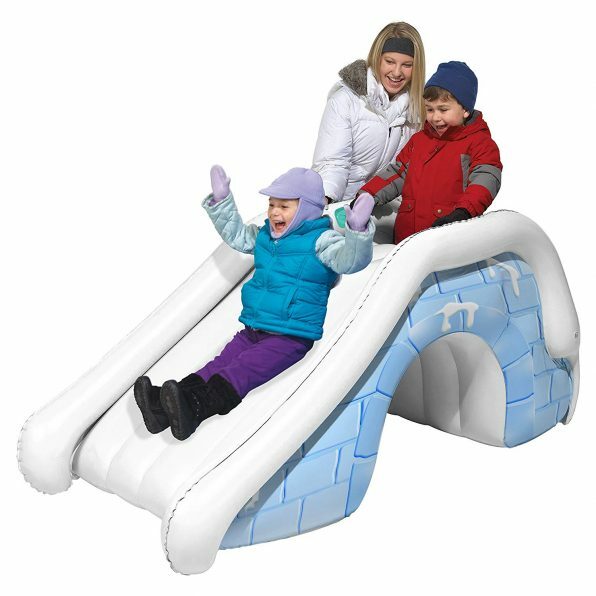 Many popular retailers sell the Sno Igloo Snow Slide including Walmart and eBay.